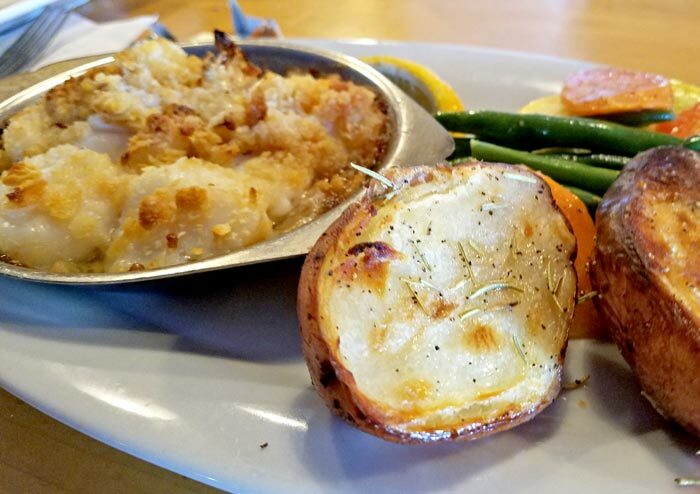 After 40 years, this restaurant in Danville is fresh, modern, and serves outstanding food. There is nothing “fufu” on the menu, it’s more meat and potatoes with a gourmet flair – simple food done well. We had heard good things about The Creamery so recently we decide to try them out. Finding them was pretty easy, located in downtown Danville (turn at the General Store), parking was a little confusing though. When you pull in there is parking alongside the buildings but what appears to be the main parking area at first is really the beginning of driveways to other apartment buildings farther back. Once parked, our experience was fantastic. I immediately took note of the little porch off the back of the building. A quaint outdoor space with linen covered tables. Inside, the image of an old time creamery jumps to mind just based on the floor plan. Immediately inside the door to your left is an alcove, separated from the main space by a railing and a receded floor. Stone walls are visible from floor to waist height – it looks l what looks the area of a creamery where milk is kept cool. The rest of the space would be open, except for the placement of a free standing room that splits it into three sections, provides some acoustic value, and adds intimacy to the space. A bar finishes out the dining area. Overall, an air of fine dining is established with cloth-covered tables, a very organized layout, and tasteful, unobtrusive decorations, but there is a very approachable feeling to it created by the layout, soft wood tones, and country items such as the daily menu written on an old piece of slate propped up or carried around for guests to see. The staff was prompt, offering great service. People were greeted with a smile, and the owner was around to welcome guests. We started our meal with a smoked salmon plate something that is unique to this restaurant, (at least I haven’t seen it on any local menus). Thicker cuts of smoked salmon served with fresh bread, Capers, onions, and lemon. 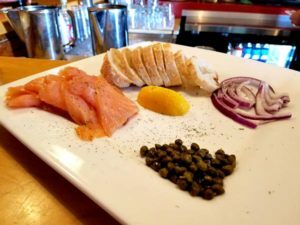 The salmon was very good, with the onions adding some crunch, but I thought the Capers made the dish too salty, but because everything was separate on the plate it was easy to leave them off. 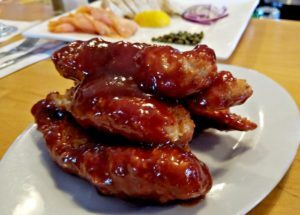 Next we tried their boneless barbecued wings. These are more chicken fingers than actual wings but were fantastically flavored. Large chicken tenders, hand breaded, fried to perfection, then toast tossed in a thick, sweet barbecue sauce. There were six to an order, and we only were able to eat three between the two of us. 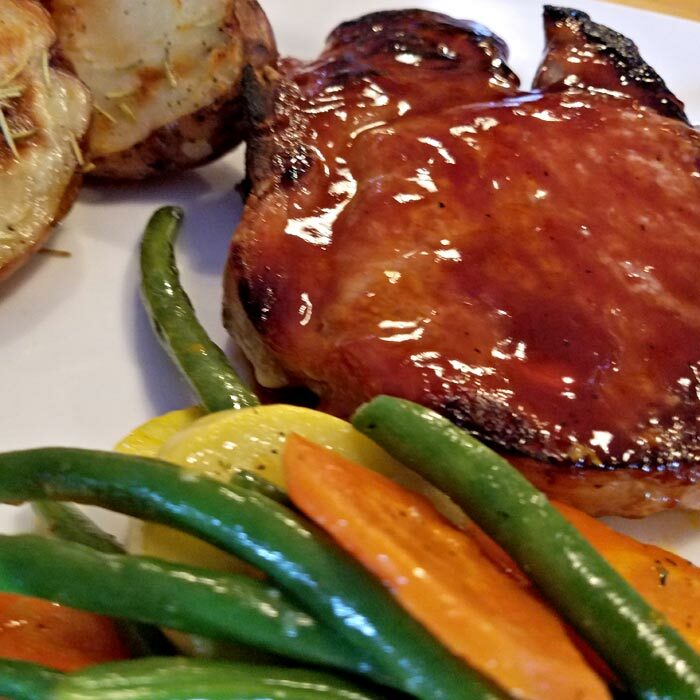 For our entrees my husband got the maple BBQ pork chop. This chop came out covered in a flavorful barbecue sauce. It was well cooked and seasoned. The entrees that night came with a veggie medley consisting fresh green beans and yellow squash. Now, I often dislike restaurant cooked squash as it is mushy. But this was slightly sauteed so that the squash was still crunchy and there was a lemon taste to it that was very surprising. The beans were also well cooked and seasoned. I ordered the baked scallops for my entree. This was a hearty-sized portion of perfectly cooked scallops covered with a crunchy topping and swimming in a butter wine sauce. I think they could have used a bit more salt and garlic but other than that they were delicious. Both meals also came with baked potato halves, with crispy skins and the exposed potato was a bit toasted. I was very happy with this meal and commented on how fresh everything tasted. The owner took some time to talk with us and let me know that she shops around locally as much as possible for produce. Most of it, at least through the summer, comes from her sister’s greenhouse. It doesn’t get much fresher than that. Congratulations on more than 40 Years of business! The restaurant has a full bar with a few beers on tap. I was able to enjoy a Mudslide and a glass of wine while my husband had his standard martini and a Switchback. They were missing a specialty cocktail list, but the bartender was comfortable making standard cocktails, and was willing to try others if you knew what was in them. Prices are on par with similar local establishments. There was a group of regulars at the bar when we got there. They came in for dinner and drinks, to talk about stocks, local business, and the weather. To me, this was a very telling – showing a business that is community supported and a home away from home for some, and to be expected of a restaurant that has made it 40 years. This Danville restaurant is a diamond in the rough, a place that one may never expect to find in a farm town. 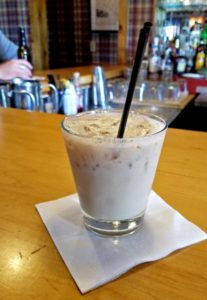 If you’re looking for a beautiful drive through Vermont’s NEK, and a fantastic place to eat near St. Johnsbury, take Route 2 through Danville and give The Creamery a try.